← President Jonathan Hunt urging members to attend the Charter meeting Monday night, November 1st. 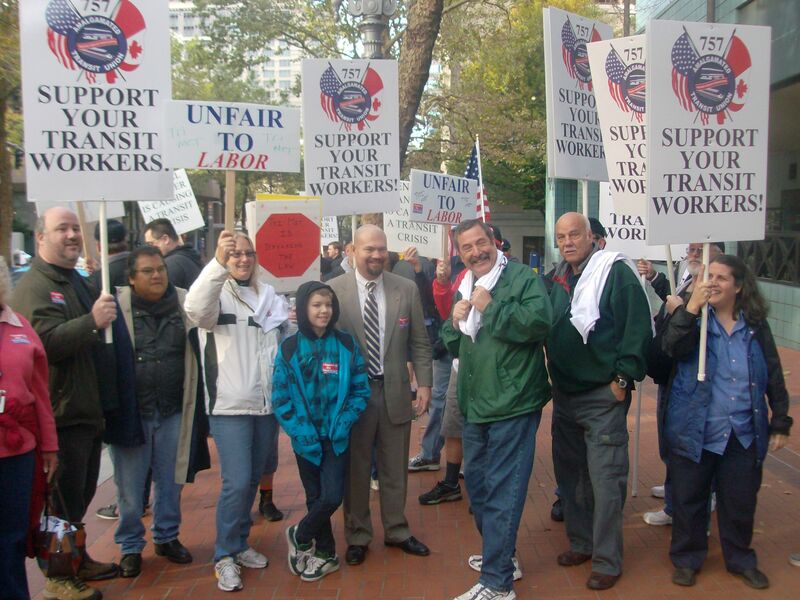 Informational Picket held by ATU 757 outside TriMet Board of Directors meeting in Portland, October 27th. Please join us as we once again hold an informational picket prior to the TriMet Board Meeting. November 10th, 8:00 am, Smith Memorial Student Union Room 329, Portland State University, 1825 SW Broadway, Portland. Stop using the media to persecute their own employees. Stop risking the public’s safety. ATU 757 has offered many changes to the contract that will save TriMet millions of dollars during negotiations; TriMet has refused to consider them. Our officers remain ready to bargain. This entry was posted in Uncategorized and tagged Amalgamated Transit Union, Board of Directors, info picket, Portland State University, TriMet. Bookmark the permalink.